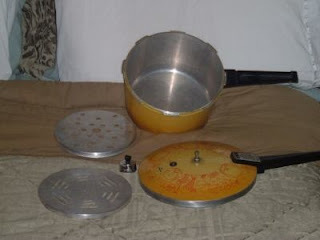 Mom had a pressure cooker like this (although hers didn't have any designs on the cover). And like all kitchen things of the 70's, it was harvest gold. She didn't use it much at home but when we went on holidays in the camper she used it to make cooked dinner. Heaven forbid she stop cooking on vacation. And look at this, photographic proof that the pressure cooker existed and was used on vacation. 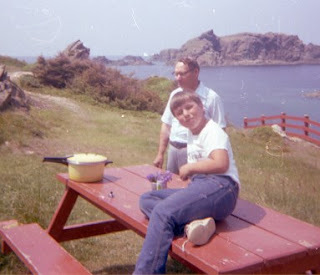 I'm not sure where this photo was taken (maybe Twillingate) but that's my Dad in the background and my younger brother on the picnic table with the pressure cooker. And if you look really closely you can see an iceberg way off in the distance to the left of the rocky island. Posted by Karen at 3:59 p.m.